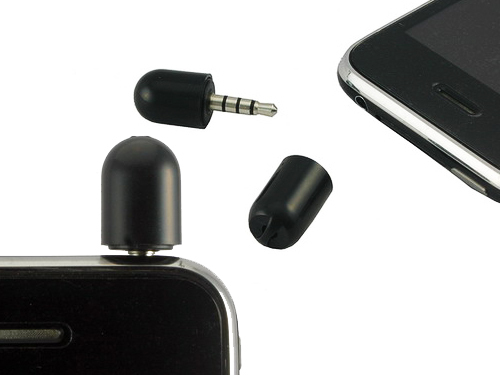 Brando Adds A Tiny Mic To Your iPhone | OhGizmo! I’ve seen all sorts of gadgets and accessories that help my iPhone with outputting sound, but rarely do you find one for input that’s not just another Bluetooth headset. Well the folks over at Brando decided that they needed to create a very simple microphone with the iPhone in mind. This is definitely one of those gadgets where its size is both a positive and negative thing. On one hand you wouldn’t want to have some giant mic sticking out of your phone or sitting in your pocket all the time. However, I still lose my car keys on a regular basis, I’d give it a week before I lost this thing. Still, at $13, it’s not a bad deal. I'm probably missing something here, but what's the point? The iPhone already has a microphone.